Hoe hoe grow: Indecision rules ... maybe ! It sounds very simple really ! I am currently mid- Autumn garden re-shuffle, and I have found 3 rose-sized gaps in the borders. 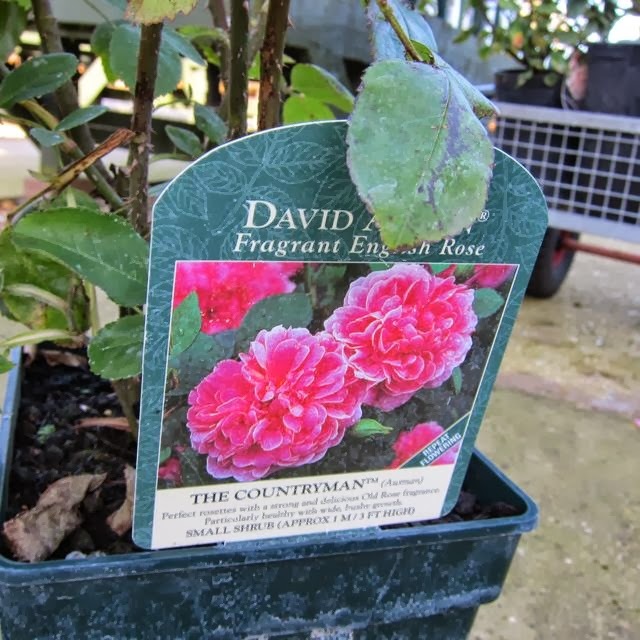 The logical - and wonderful- thing to do is to hotfoot it down to my nearest David Austin nursery and buy 3 roses to fill those gaps, pretty damn quick ! Simple ? 'Fraid not ! Choosing is a delicious mix of pleasure and pain. I am so excited at being able to choose brand new roses to add to my collection, but unable to choose ones I really, really want because I don't know which ones I really, really want. Believe it or not, this is genuinely my THIRD attempt to do this. The first time my partner was patiently standing waiting, and he put me off. I couldn't concentrate even though he wasn't even sighing or looking at his watch. he was just watching me, and apparently that was enough to destroy my concentration, so we had to come home. The second time (different nursery) I was with my daughter and grand daughter. Now, my daughter said I could be as long as I wanted, but after only ten minutes, she started saying things like "that red one over there looks good, why not buy that". Oh dear, seems that put me off as well, so we had to come home. So today I went by myself and allowed endless time to perfect and hone my skills of indecision. 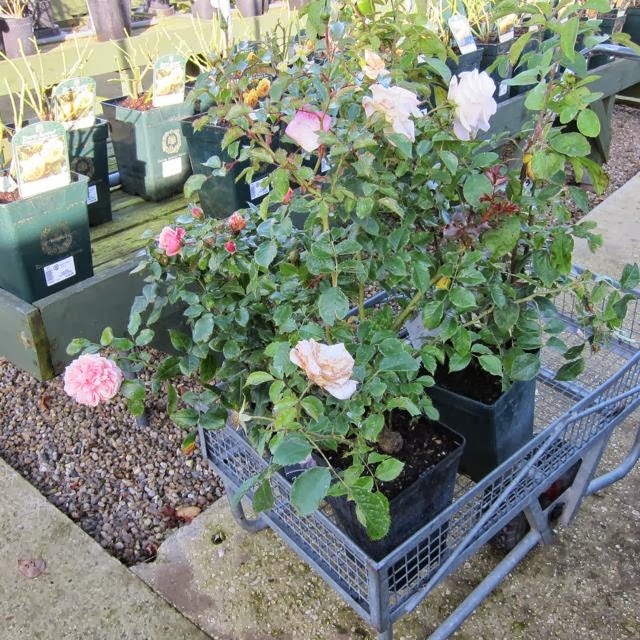 Unbelievably, I had two roses in the trolley after only about fifteen minutes - two unplanned Floribundas, for the price of one David Austin. I do love a bargain. 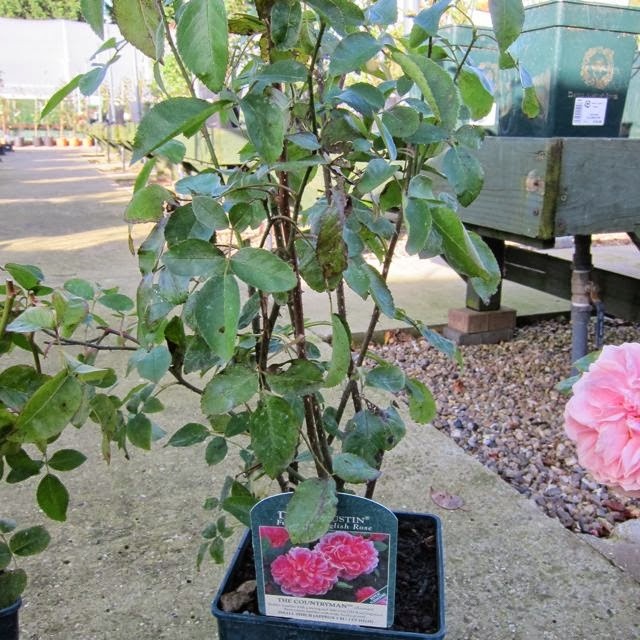 One was 'Joi de Vivre', voted 'Rose of the Year 2011' (see header photo). It grows to about 50cm high x 40 cms wide. It is a repeat flowerer and the foliage was positively crackling with health. Not a sign of black spot even at this point of the season. 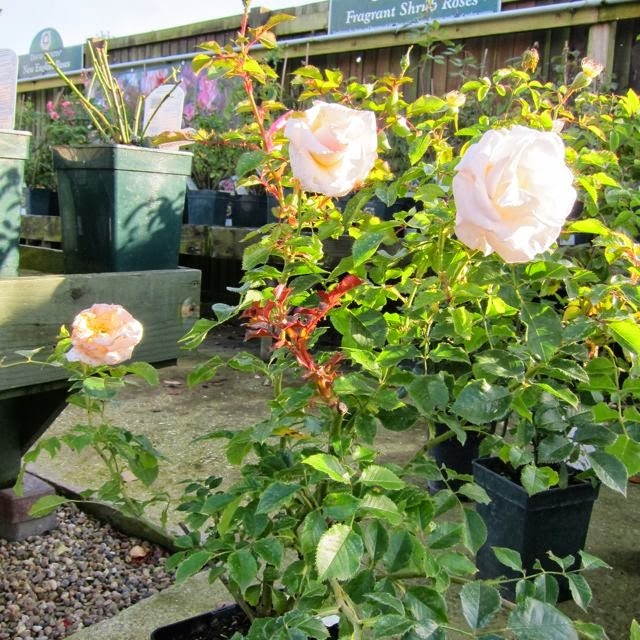 My other purchase is 'The Attenborough rose' which looks like a shrub rose, big, vigorous and healthy, with very pale pink flowers. It will grow to about 1.25 metres and is a repeat flowerer. It is covered in flowers even now. It is not a rose I know, so hope it lives up to its promise. Sister Elizabeth - small , only about 60x60cm. Didn't say it was a repeater. I finally whittled it down to my top three, Wildeve, Claire and from there got my winner ... ta dah ... 'The Countryman'. So how did I finally decide ? I applied the following critera - it had to be a repeat flowerer, and it had to still look good, even in mid-October. 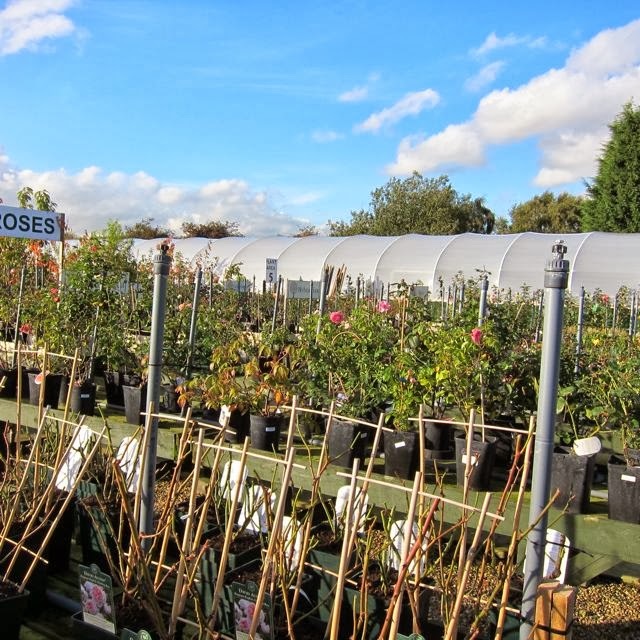 Lots of the roses on display at the nursery (not just DA) had blackspot, yellowing leaves, or were de-foliated. 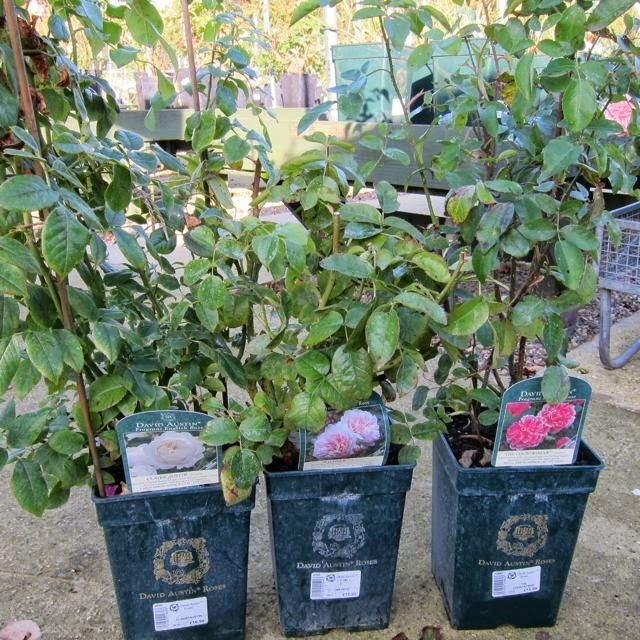 The ones in my final three were all clearly disease-resistant and had good healthy foliage. The plants themselves, had to be a good size and shape, with leaves to soil level. Flowers or buds were a bonus, and I tried not to be influenced by those. So, they were finally in the trolley ... and it only took an hour and a half ! Lol! I feel your pain, I have the exact same problem. You don't mention scent - I hope they are all smelling gorgeous too! Well observed Emily ... I have a rubbish sense of smell, so scent is never high on my agenda but I would think it is very important to many rose lovers ! 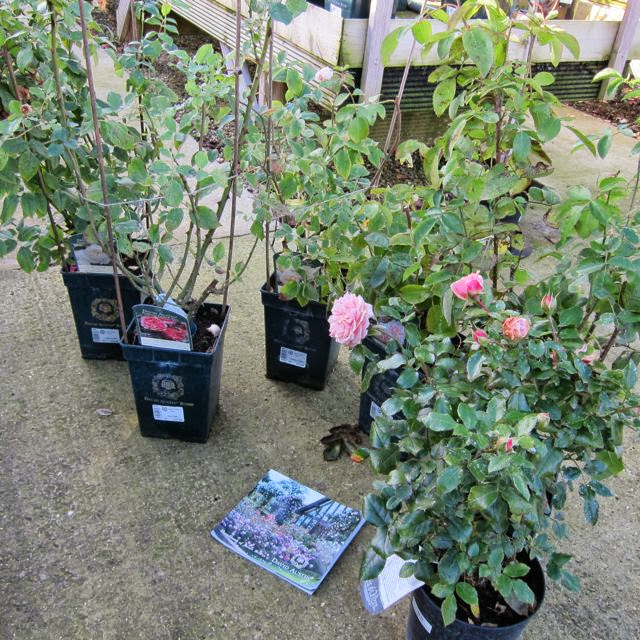 It IS hard to pick out a new rose! I have gone to the rose nursery in 100 degree weather, hemming and hawing, and walking around and around and around. The workers just tell me to call them when I decide! No one else is there, and I have the whole place to myself to think! (Yes, I'm a thinker, too!) The roses you decided upon look fabulous and I hope they do great in your garden. New roses! Nothing could be better than that! Hi HG. We sound pretty similar in the rose-choosing department ! I don't do it with anything else like clothes or shoes ! Straight in there ! I want them all, too. I do my research before I go so I know exactly what I'm looking for. But I still get sidetracked by plants I hadn't considered when I was researching. I never go to a nursery with anyone I'm related to. I prefer to go alone so I can spend as much time as I want. I , too, am the cat who walks alone when it comes to nurseries - no friends or relatives, just me ! I wouldn't inflict my indecision on ANYONE !! It is a thing which cannot be rushed. It has to be savoured, slowly, and every decision carefully considered ... only then can you make that random purchase you never inteded to ! I know this feeling very well! When I saw your shortlist of DAs, I was drawn straight away to The Countryman. 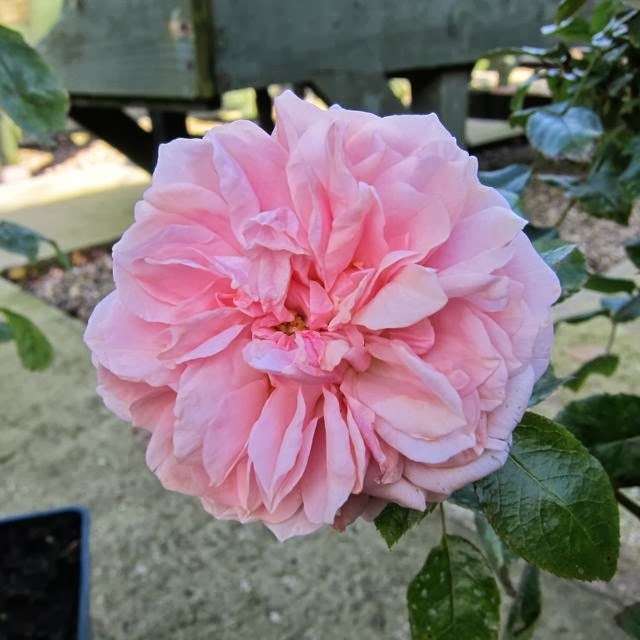 We saw it in several gardens in England in 2011 and I fell in love with it then, but unlike you I have no rose-sized gaps in the garden at the moment (except in the shade). So I'm glad you chose it because I can enjoy it vicariously (please post lots of photos next summer). The Countryman is quite a good strong pink ... very appealing. Do DA's grow well for you? I know that some do not like extremes of weather. I think you have done a great service to shopping women everywhere who are at this moment reading your post out loud to their partners. Your purchases are beautiful, I wish I could bury my nose in them. Their partners will be groaning and snorting I think!! 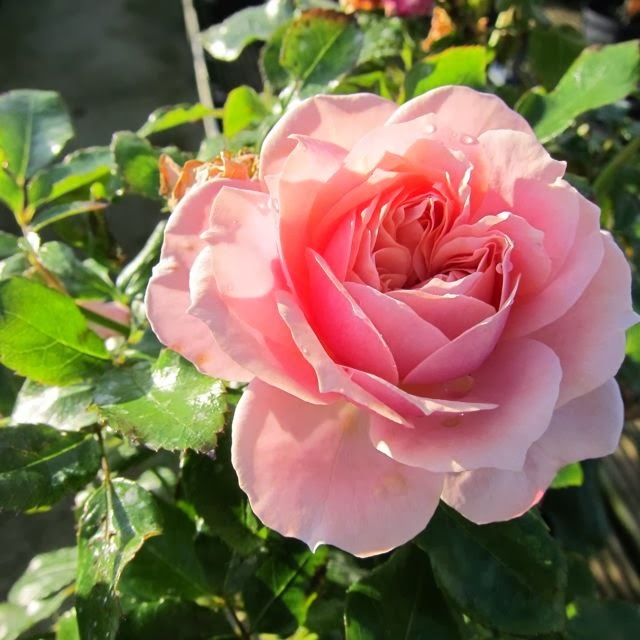 How nice to visit your blog and find a post about roses, my favorite topic! I can completely relate to you, it always takes me forever to decide which new roses to buy. After all there are so many out there and with limited land aka a really small garden I need to be very decisive. 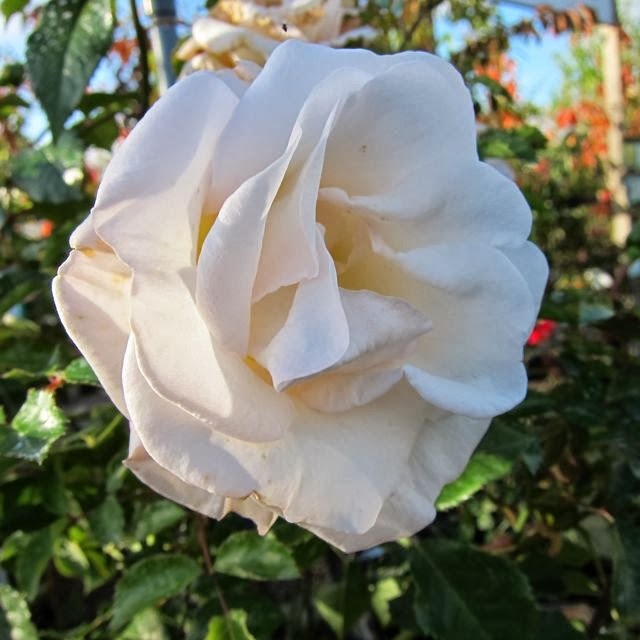 I love 'Joi de Vivre', a rose I have never heard off. Good luck with your new purchases. I hope they meet your expectations.